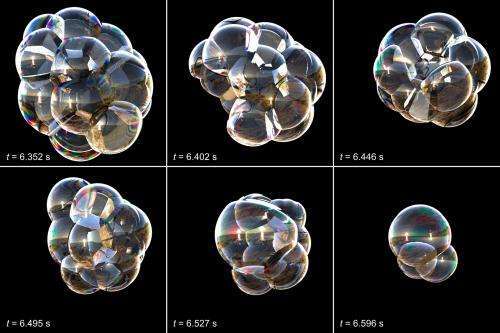 Saye and Sethian discovered a way to treat different aspects of the foam with different sets of equations that worked for clusters of hundreds of bubbles. One set of equations described the gravitational draining of liquid from the bubble walls, which thin out until they rupture. Another set of equations dealt with the flow of liquid inside the junctions between the bubble membranes. A third set handled the wobbly rearrangement of bubbles after one pops. 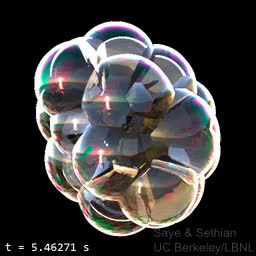 Using a fourth set of equations, the mathematicians created a movie of the foam with a sunset reflected in the bubbles. Solving the full set of equations of motion took five days using supercomputers at the LBNL's National Energy Research Scientific Computing Center (NERSC). More information: "Multiscale Modeling of Membrane Rearrangement, Drainage, and Rupture in Evolving Foams," by R.I. Saye et al. Science, 2013. The effects of white hole collapse into black holes may be related to the dissolution of bubble clusters (and emanation of gamma ray bursts during it). In AWT the white holes do appear like large giant clusters of black holes which do coalesce gradually. Never mind the crackpop, he (most likely) sees rejected fringe ideas in everything.